A quality filter helps you to clean up the cosmetic appearance of your wine and protect its stability, without requiring you to risk spoilage or oxidation by filtering over and over again. 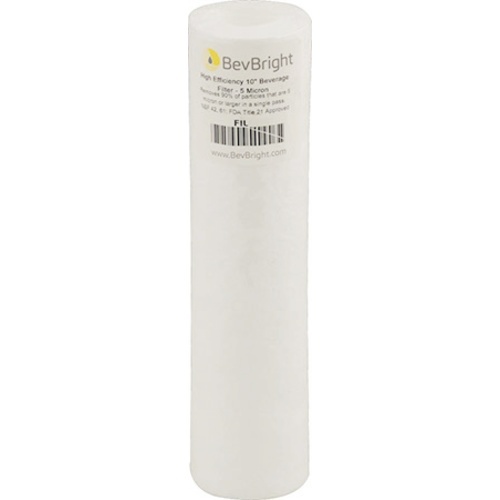 BevBright's™ three micron filters are disposable, multi-zoned, cartridge style filters perfect for filtering wine with any standard 10" filter cartridge housing. BevBright™ achieves superior efficiency by being the first to spin different diameters of poly strands on the same filter core to create zones of filtration. The zone closest to the core contains consistent, tight fibers for final filtration while the final outer layer zone is spun with larger fibers for increased sediment holding capacity and increased flow capacity. The best of both worlds. By comparison typical spun poly water filters are spun with only one size of fiber. Note that these are True 10" Filter Cartridges that rely upon the housing being closed tightly in order to engage the Knife Seals & eliminate bypass. A 3 micron rating is the perfect middle ground for filters. Wine's not totally clear, but not completely hazy? A 3 micron will do wonders. It will take out all yeast cells and visible haze, but won't clog like a 1 micron if haze is present. If there's heavy visible haze, a 5 micron will be a better place to start. No haze whatsoever, and a 1 micron will brighten your wine beautifully! The efficiency rating tells you what % of material, at the given micron rating, will be filtered out in a single pass. The High Efficiency rated filters work better than any 3 micron rated hardware store spun poly filters. Cheaper spun poly water filters are never rated for efficiency because they only remove 60-80% of the material at a given micron rating in a single pass. High Efficiency - Removes 90% of the material 3 micron or larger in a single pass. Super High Efficiency - Removes 98% of the material 3 micron or larger in a single pass. I want to have crystal clear beer and have read the 3 micron, 98% is best for beer clearity. I seem to have a issue with these filters fitting properly into the plastic canister. I have to tighten down the top of the canister with extreme force in order for the lid to meet the sealing gasket. This is consistent for the 5, 3 and 1 micron filters. Filters seem to be about 1/4" too tall. I got this to brighten up a slightly hazy beer. It works as advertised. Works well for the micron size. My beer usually settles out by time I put to a 5 gallon kegs from my 10 gallon holding/aging keg. I swapped to the 1 micron over the 3. If your beer is young and you’re eager to get it carbonating; these filters are for you. These filters do not fit either of my two 10" MoreBeer Beer Filtering Kits or Freshwater Filter kit. Filters are exactly 10" high but canisters will not close completely. I just lost almost 2 gallons of Pliney the Elder onto the floor. Water filter cartridges are just under 10" as are another company's beverage filters which work fine in the standard filter kit. These don't. Don't recommend unless you enjoy wasting all your hard work. Sorry you experienced this issue and we cried when we read that pliny hit the floor. You are correct in that these are true 10" filters and not 9.75" water filters. The upside of that is that the cartridge fits the housing without blow by at the top and bottom. 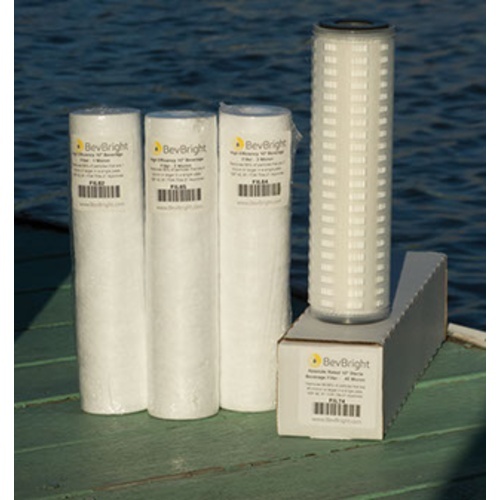 The downside is that it requires more force to close the lid on the 10" housing when Bevbright filter cartridges are used versus generic water cartridges.